VATSIM.net View topic - vPilot with Two Audio Outputs? - Mon Mar 30, 2015 1:01 am #484936 Is this possible? Maybe a feature request? Since switching to P3D v2.5 I have not been able to use squawkbox and miss being able to split the comms into comm1/comm2 via different audio outputs. On my simconnect PC I have a headset which was mapped to comm1 and then comm2 would be mapped to the computer speakers. This was great as I could take the headset off in cruise, listen to atis/other ATC as I flew. Is this something which is planned? If it can be done now, how? I don't see anything within the settings or after searching. - Mon Mar 30, 2015 1:06 am #484937 It can't be done now. Not planned either, but who knows, it might get added to the todo list in the future. - Mon Mar 30, 2015 1:58 am #484942 +1 on this request! Same use case as Tom's. While 1 output can work, two outputs can provide better mixing. -Scenario1: On the ground I can have TWR/GRD/APP in my ear, while monitoring CTR on comm2 while on the ground. -Scenario2: Approaching an airport I can have CTR/APP in my ear with ATIS on comm2. With Unicom I put 122.8 in comm1 and have comm2 listening to a frequency up ahead or just one I want to listen too since I am in uncontrolled airspace. I don't know how I could toggle between headset/speakers at the push of a button. Maybe someone else knows. Tom Bergman 1005898 wrote: -Scenario1: On the ground I can have TWR/GRD/APP in my ear, while monitoring CTR on comm2 while on the ground. Not sure why you'd be listening to CTR while also listening to TWR/GND/APP, but okay. Tom Bergman 1005898 wrote: -Scenario2: Approaching an airport I can have CTR/APP in my ear with ATIS on comm2. That makes a bit more sense, but I've never had a problem listening to the ATIS through my headset while monitoring the controller also on the headset, but okay. Tom Bergman 1005898 wrote: I don't know how I could toggle between headset/speakers at the push of a button. Maybe someone else knows. You can't ... I was suggesting that as an alternative for a future vPilot feature which would also allow you to listen to comms over the speakers while in cruise without wearing the headset. Ross Carlson 887155 wrote: You can't ... I was suggesting that as an alternative for a future vPilot feature which would also allow you to listen to comms over the speakers while in cruise without wearing the headset. That would be nice...sometimes the headphones get a bit uncomfortable. One thing that seems like it could be useful would be to have important alert sounds (contactme's, SELCALs, and .WALLs) be broadcast through speakers (and if possible, the headset as well). - Mon Mar 30, 2015 4:13 am #484955 The sounds always go through your default Windows playback device, so you can set that to whatever device you prefer. - Sun Nov 18, 2018 10:47 am #528786 Hello, any news about this feature? I'm using a real audio panel on my cockpit so I'm able to spilt the COMMs channels into comm1/comm2 via different audio outputs and can tune the volume for each separate channel. 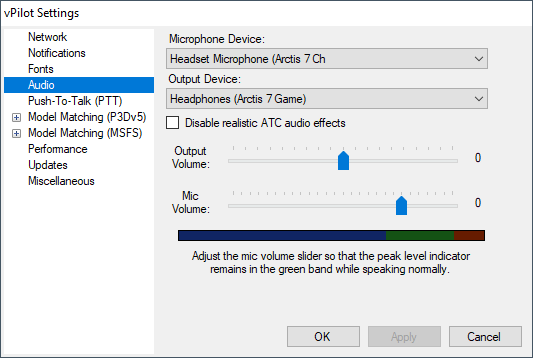 Would be fine if in this windows you can add one more setting for second device audio so that will possible to dedicated one device audio out for COMM1 and one for COMM2. so no news about split COMMs on two different audio device? Ross Carlson 887155 wrote: It can't be done now. Not planned either, but who knows, it might get added to the todo list in the future. I'm looking your last vpilot release and I would known if you can add the possibility to split the comms into comm1/comm2 via different audio outputs (like was possible by squawkbox).